Ms. Chang has years of experience in Silicon Valley high-tech startups. She has extensive experience in operations, business negotiations, strategy planning and corporate management. Prior to Aviacomm, Ms. Chang served as VP of Business Development & Operations in RedDot Wireless and Director of Business Operation in PrediWave Corp. She plays an integral role in fund raising, team building, and establishing partnerships with foundries, OEM’s, and brand name partners. Ms. Chang holds an MA degree from the University of California, Berkeley, and graduated with a BA degree from National Taiwan University. 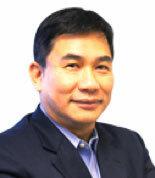 Mr. Shih Mo is an expert in Wireless Communications with a career spanning over two decades. Prior to Aviacomm, Shih Mo was the founder and CEO of RedDot Wireless Inc, a founding member of Malibu Networks, and Chief Architect at Quantum Corp where he was named a Quantum Fellow in 2000. He has successfully led developments of numerous baseband and RF integrated circuits for WiMAX and WLAN, and has extensive experience in Software Defined Radios. Additionally, Shih Mo participated in the development of the 802.11 and 802.16 wireless standards. Shih Mo was a Ph.D. Candidate at University of Southern California. He is the owner of several US patents and the author of numerous technical papers. Dr. Hans Wang has been in engineering management for more than fifteen years. He has served as engineering director, product engineering, chief architect, and CTO for Emergent, RedDot Wireless Inc, and PrediWave Corp. He has abundant experience in Software/System and product delivery for semiconductor solutions. He has demonstrated several times the ability to lead R&D teams, drive engineering samples from prototype to production and generated major revenue. Hans received his Ph.D.in Electrical Engineering from the University of Sydney, Australia. YC Wang has 32+ years industry experiences, in all aspects of semiconductor design, development, marketing, and operations. All levels of engineering and management positions with AMD, Cypress Semiconductor, Chiplink Corp., Myson Century, Shanghai Belling, ApaceWave Technologies; including many years of management position in Taiwan and PRC semiconductor companies. Mr. Takada has extensive expertise in company strategy, business development, and is a visionary in determining technology trends. Prior to Aviacomm, Mr. Takada spent more than 30 years in engineering and executive positions in Sony Japan and Sony USA developing new digital products including US digital Set Top Boxes, Digital camcorders, Digital TVs and more. He was also deeply involved in the establishment of worldwide standards such as DVB and IEEE1394 technology.